Next earlier Peg Schaeffer column: -Happy Tale: Brutus. happy in his new home Posted 29 Sep 2014. Did you ever have one of those days? Well I've had one every day this week. On Monday a woman called me about four puppies she needed to find homes for. She said she'd been calling the shelter all morning and hadn't gotten an answer. I told her that the shelter was closed on Mondays and that they would open on Tuesday. She went on and on telling me how she couldn't afford to feed them and that there mother had abandoned them. She was going to contact her friend and bring them to me that night. She never called back and never showed up. On Tuesday evening she and her friend brought four puppies to us. 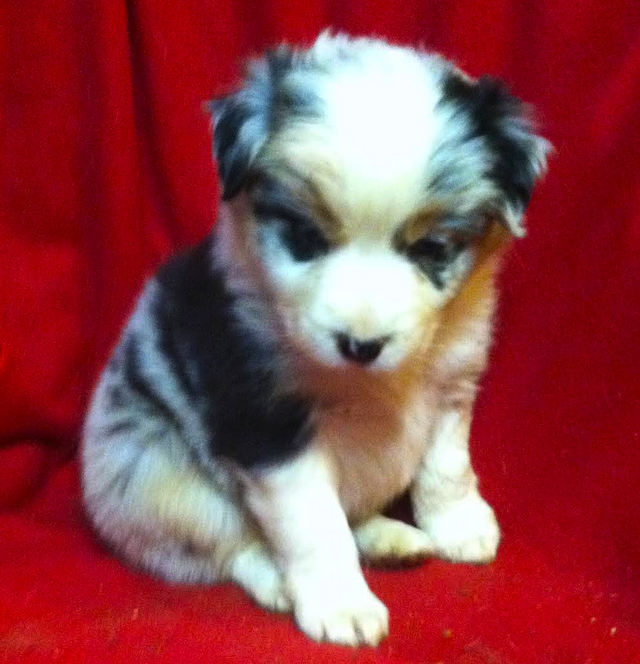 They were cute little fluffy Australian Shepherd puppies that were only 5 weeks old. I set them up in the downstairs bathroom with a pen with the floor lined with puppy pads. They had a warm blanket and some soft toys. I made them supper of puppy chow mixed with milk replacer. Wednesday morning I had to take three dogs to the vet in Greensburg. One was being neutered. One was being groomed and one had been kicked by a horse and was being checked for a broken leg. On my way to the vet's someone called about a senior dog that had shown up in their yard. She said it appeared that the dog had been hit by a car and he had something wrong with his ears. 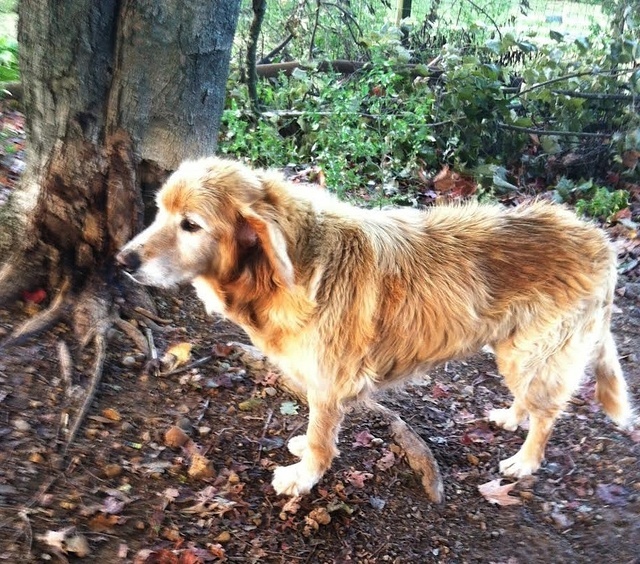 She was on my way to the vet's office so I stopped by and picked up a graying Golden Retriever. While at the vet's I asked about a vaccine for the puppies since they were only 5 weeks old. Dr. Olt gave me four vaccines suitable for puppies at that young stage. Thursday morning one of the female fluffy puppies was adopted. I received several calls about the rest. I needed to go back to Greensburg to pick up the four dogs I had left on Wednesday. I was planning on getting them first thing in the morning but by the time I adopted the first puppy out, fed the remaining puppies, and took care of the rest of the dogs it was almost noon. I opened the door to the Tahoe and the dogs starting jumping in. I don't know how many I had with me. One of them was a black Lab named "Sadie". When I got to the vet's I went in and got Gladys, the dog who had been kicked. Gladys had just a hairline fracture and was given some medication. I took her out to the Tahoe. When I opened the door Sadie jumped out. She had jumped out on Wednesday when I dropped the dogs off and had gone into the clinic. She walked around the waiting room, checked out the cats, and decided to help Joyce, the receptionist, at the front desk. In the meantime a woman came to pick up her dog. She commented about the number of dogs in the SUV in the parking lot. I explained that they were rescue dogs and liked to go for a ride. Sadie was wandering in the waiting room and went up to say "hi". Gracie was the next dog to load up. She was in a crate so two of the techs carried her out to the Tahoe. In the meantime the woman went out to her car with a bag of dog food she had purchased. She opened the back door and Sadie jumped in and made herself at home. The woman looked at me and said that my dog was in her car. I laughed and told her it was her dog now. She looked at Sadie sitting there as big as life itself and said "well I've been looking for a black Lab, I guess she found me." I gave her my business card and she gave me her name and address so I could send her adoption paperwork. Everyone in the clinic saw what had happened and were laughing. They said the woman would give Sadie a great home. And I told them that from now on I would bring an adoptable dog to jump in someone's car. We joked about it and they brought out the Golden Retriever. He was already neutered, he needed a tooth pulled, and his ears were infected. So I loaded him in the Tahoe and headed home. On the way I had seen a yard sale sign and told myself I would stop at just one yard sale. I owed it to myself. So I turned down the road and went to the yard sale. It was a good yard sale and I found several bargains. When I opened the door to load my stuff four dogs escaped. They scattered everywhere. Gladys just wanted out. Darryl wanted to meet everyone. Diablo just wanted to explore and Timber wanted to play with the kids. I rounded them all up threatening their lives and headed home muttering that that was the last yard sale I was going to with all these dogs. It was after two so I stopped at Little Caesar's for a pizza. When I went to pay for it I couldn't find my wallet. Then it dawned on me - while I was chasing the dogs I had put it on the hood of the Tahoe. I didn't remember putting it inside. So I had to drive back to the yard sale and half way down the road I saw my wallet laying there. Back to to the pizza place, picked up the pizza and headed home. Someone was going to meet me at the house for a puppy and she called to say she was at the house. I told her I'd be there in 20 minutes. As I was headed back and was thinking about Sadie being adopted at the vet's I realized that I had left four dogs there on Wednesday and had only picked up three. I had forgotten Hercules! I couldn't turn around because I was meeting someone so I called the vet's office and told them I'd be back. Adopted out a female puppy and then got a call from someone interested in one of the males which left one puppy. Someone called about him and was headed our way. So Keith had to make the return trip to the vet's while I adopted out puppies. I was so glad when Thursday ended. Friday I was supposed to go trail riding with a friend at Green River. I woke up to rain. So much for a relaxing ride without the dogs. Later in the afternoon I received a call from someone who was interested in the last puppy. They wanted to come that night. They lived 2.5 hours from us and arrived at 9:30amCT that night. They fell in love with the puppy (who couldn't?) and off he went to his new home. So Monday through Friday was "one of those days". But guess what? I can look back at each day and laugh. I found "furever" homes for four puppies. Gladys doesn't have a broken leg. Gracie has a new "do". Max, the Golden Retriever is on the mend and will be available for adoption if we don't find his owner. And Hercules - he might have had a longer stay but when Keith went to pick him up he got to see Shiloh, Hercules' sister, who has been at the vet's since August 11 for wound therapy. "One of those days" wasn't so bad after all.